Figure 11. Comparative Bar Paths -- Raising the Bar. (4) = CHST, (6) = MXVR, (8) = MNVR, (9) = END. See text for further description of these characteristic instants and angles. The geometrical nature of the relationship force capacity and position suggests that purely geometrical changes in technique could lead to significant changes in that relationship and hence to significant improvements in bench press performance. The area to be helped most by geometric changes in technique is that portion of the force versus height curve near the sticking point (i.e. in Figure 7, position (7)). An increase in curve height in this sticking point region will directly increase the weight that can be lifted in the bench press. 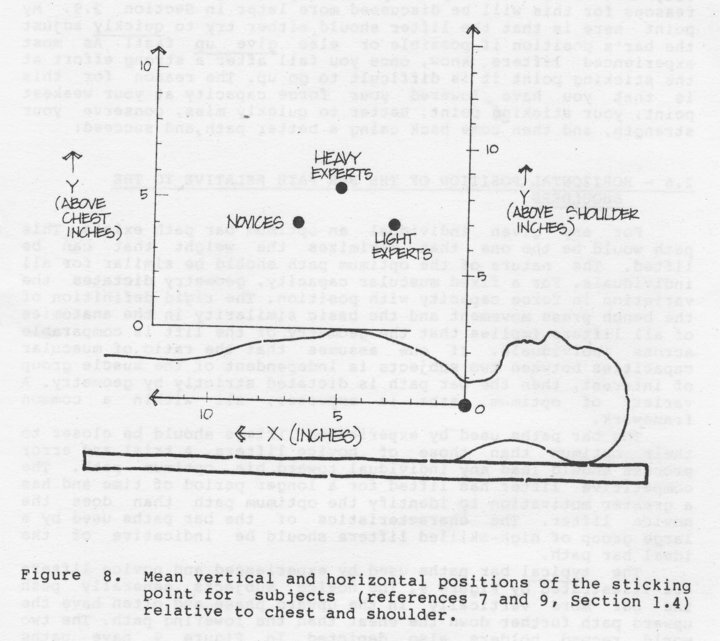 The degree of the sticking point phenomenon plays an important role in performance of the bench press. The work done on the bar by the lifter during the raising phase must be equal to the increase in gravitational potential energy associated with the bar. Work is an integral of force. To maintain a given capacity for work, a decrease in force in one position must be compensated for with an increase in force at some other position. A decrease in force capacity below the bar weight at one position requires a corresponding increase in force capacity above the bar weight at another position. For a given muscular capacity, the less dependent force capacity is on position, the more weight can be lifted. Bench press training should thus emphasize developing force capacity as much as possible in the entire region of the bar’s path during the bench press. 1. Training techniques used by the high-skilled lifters that preferentially build strength near the sticking point. This is an area I am presently investigating (i.e., how to train this sticking point region most effectively). 2. Geometrical differences in bench press techniques (to be fully discussed in the next two sections – 2.6 and 2.7). The second possibility was most intriguing. Could a lifter increase the weight he could bench press by simply changing the path he chose to have the bar follow? In order to evaluate the likelihood of this possibility, we needed to be able to quantify the differences in technique between high-skilled and less-skilled groups (references 7 and 9, section 1.4). As will be discussed in the next two sections, the high skilled subjects DO use technique to increase the weight they can bench press. It was also very interesting to note that highly skilled lifters that I analyzed over time (unpublished data) showed a considerable increase in their capacity to generate force at their sticking point, while exhibiting a very minor increase in their capacity for generating force off the chest. 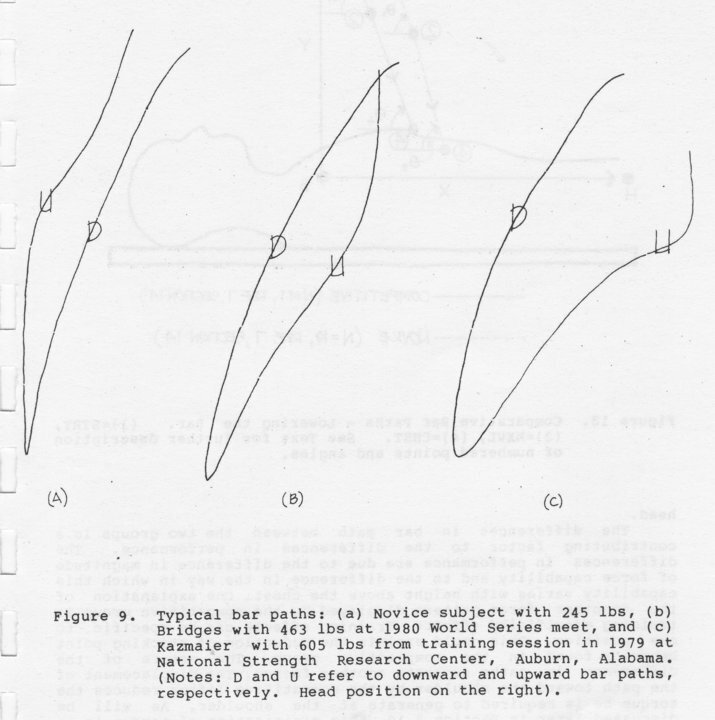 This data was obtained by analyzing lifters like Bridges, Gaugler, Kazmaier, etc. at Senior National and World Powerlifting meets each year over 2-4 year periods. It was fascinating to note that these lifters’ bar paths (to be discussed in the next two sections) also changed as predicted. In other words, over time these successful lifters changed their sticking point force capacity to some extent by changing their bar path along the lines of our research results (references 7 and 9, section 1.4). A few lifters who did not increase significantly in their bench press performance over the years I monitored (to remain unnamed!) also did not demonstrate the changes in bar path that characterized the others. More work in this exciting field needs to be done. A final point of interest regarding the sticking point involves where it occurs physically during a bench press. I could easily perform a study of any bench presser using standard cinematographical techniques and biomechanical analysis and pinpoint their own unique sticking point position relative to the chest and the shoulder. Knowing this would permit very useful and exciting training possibilities to increase strength right in this region. Obviously, the analysis also provides equally useful information regarding the lifter’s bar path and how it could be altered to also increase sticking point force capacity (as discussed later). However, since such analysis ma not be possible for everyone yet, I have created an average composite plot of the sticking point positions (means for groups in references 7 and 9, section 1.4) and shown them relative to both the chest and shoulder in Figure 8. 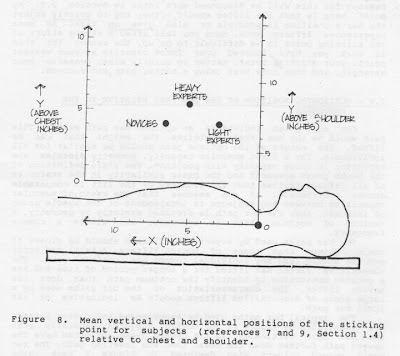 This figure should be easy to use in training as a rough guide to position, for example, in a power rack for specific sticking point training. Note, in particular, that the location of the sticking point for the expert groups is closer to the shoulder. Also note that all sticking points are relatively close to the chest (less than 5 inches or so in general). 2. Rotate the upper arms out to the sides. The typical reaction is to swing the arms out, but this ends up only fatally ending the situation. The reasons for this will be discussed more later in Section 2.9. My point here is that the lifter should either try to QUICKLY adjust the bar’s position if possible or else GIVE UP fast! As most experienced lifters know, once you fail after a strong effort at the sticking point it is difficult to go up. The reason for this is that you have lowered your force capacity at your weakest point, your sticking point. Better to quickly miss, conserve your strength, and then come back using a better path and succeed! For any given individual an optimum bar path exists. This path would be the one that maximizes the weight that can be lifted. The nature of the optimum path should be similar for all individuals. For a fixed muscular capacity, geometry dictates the variation in force capacity with position. The rigid definition of the bench press movement and the basic similarity in the anatomies of all lifters implies that the geometry of the lift is comparable across individuals. If one assumes that the ratio of muscular capacities between two subjects is independent of the muscle group of interest, then the bar path is dictated strictly by geometry. A variety of the optimum paths is expected, all within a common framework. The bar paths used by experienced lifters should be closer to their optimum than those of novice lifters. A trial and error process should lead any individual toward his optimum path. The competitive lifter has lifted for a longer period of time and has a greater motivation to identify the optimum path than does the novice lifter. The characteristics of the bar paths used by a large group of high-skilled lifters should be indicative of the ideal bar path. 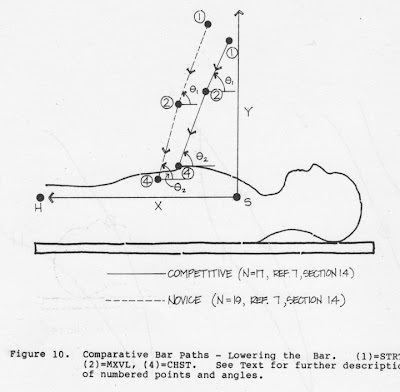 The TYPICAL bar paths used by experienced and novice lifters are illustrated by Figure 9. The novice subjects generally push the bar more vertically in the upward phase and often have the upward path further down the chest than in the lowering path. 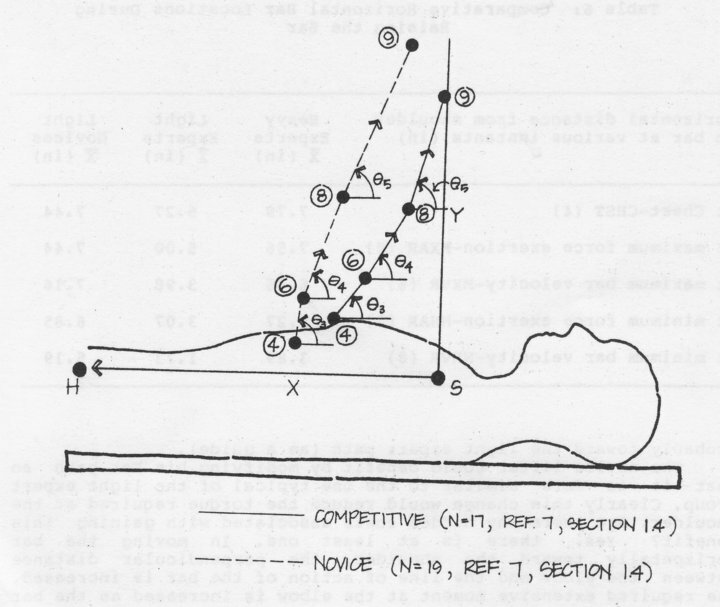 The two world record holders also depicted in Figure 9 have paths representative of experienced subjects in general. 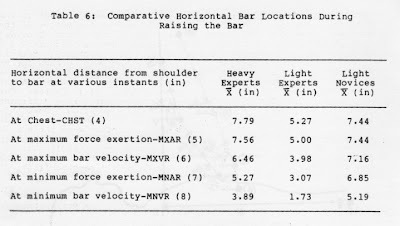 From a quantitative analysis of these bar paths (references 7 and 9, section 1.4), it was shown that the bar path followed by the experienced lifters was significantly different from that used by the novice group. 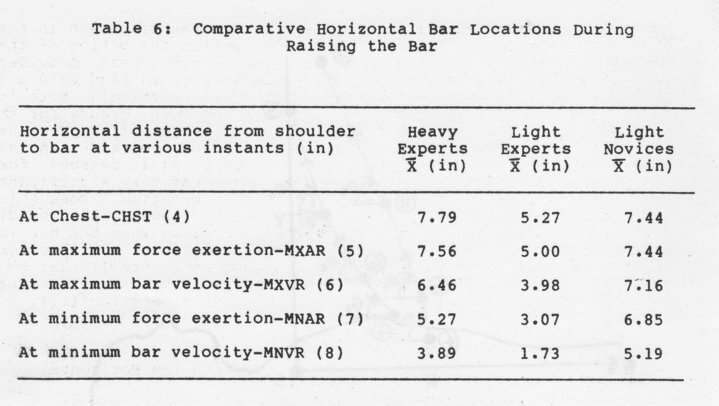 The mean horizontal positions of the bar relative to the shoulder were significantly different between the two groups at every characteristic instant. Mean paths for both groups are displayed in Figures 10 and 11. During the lowering phase the bar paths are nearly parallel with a curvature concave toward the head. The path of the competitive group (see figure 9) is displaced relative to the novice group path approximately 10% of the upper body length from the hip to the shoulder. The competitive group starts the lift 95% of the way from the hip toward the shoulder and touches the chest at 70% of that same length. The differences during the raising phase (see Figure 11) are even more dramatic. The novice group raises the bar initially moving it nearly vertically and then moving it up and toward the head. The competitive group chooses a path with the opposite convexity. The initial movement of the bar includes a substantial horizontal component toward the head. The horizontal differences in the path increase rapidly at the start of the raising phase. At the sticking point this difference is 20% of the upper body length. The paths converge near the end of the lift, the horizontal position differing by 11% of the upper body length in the finishing position. 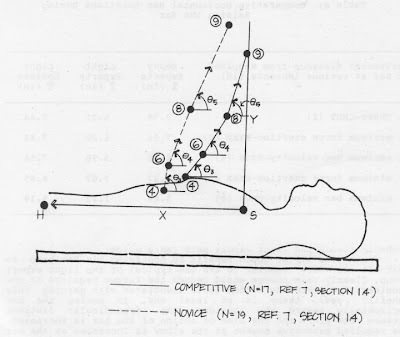 The competitive group finishes with a mean normalized position 1 ± 11% beyond the shoulder toward the head. The differences in bar path between the two groups is a contributing factor to the differences in performance. The differences in performance are due to the differences in magnitude of force capability and to the difference in the way in which this capability varies with height above the chest. 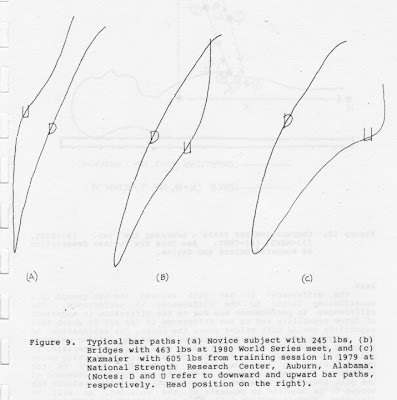 One explanation of the smoother force pattern displayed by the competitive group is training specificity effects. Training effects can be specific to one position. This could explain the reduction of sticking point behavior found in the competitive group. The nature of the difference in paths suggests another factor. The displacement of the path toward the shoulder by the competitive lifter reduces the torque he is required to generate at the shoulder. As will be discussed later in Section 2.10, this minimization of torque is an important result of this horizontal shift of the bar path toward the shoulder. So far, the bar paths discussed in this section have been those of light experts and novices (from reference 7 of section 1.4). The same trend was also demonstrated for horizontal bar position for heavy expert bench pressers (reference 9, section 1.4). Table 6 shows the horizontal locations of the bar during the raising phase for all three group. Note in this table that the heavy experts maintain a horizontal bar position further away from the shoulder than the light experts. 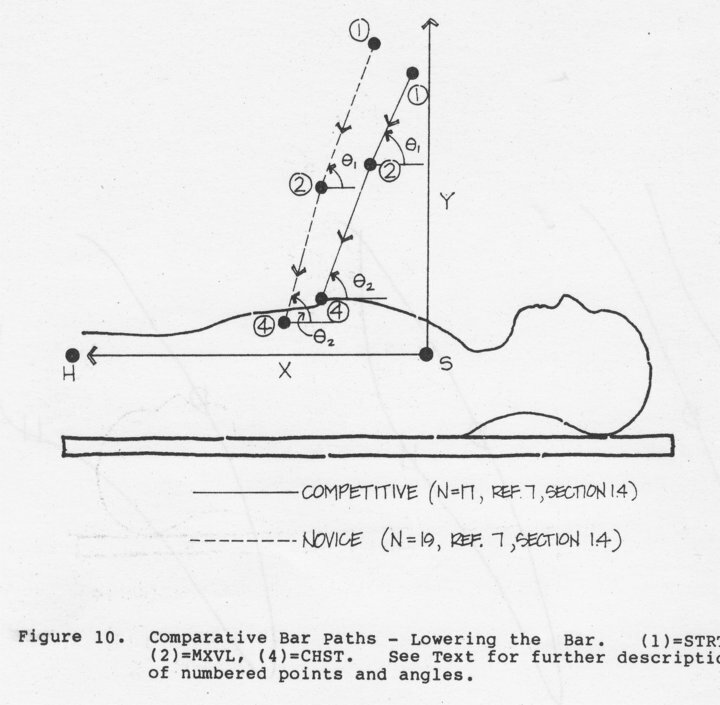 This is probably related to the greater size of the heavy experts and the limitations posed by the fixed grip width (32 inches) on the bar permitted in competition. This may prevent larger, heavier lifts from maintaining geometric similarity with the smaller expert lifters. It may be that the larger high-skilled lifters are replicating the technique of the smaller lifters as much as is permitted within the rules of powerlifting. Note that the heavy experts seek to mimic the path of the lighter experts, and even though the heavy expert group re similar in horizontal bar position to the novices early in the lift, they quickly move the bar horizontally throughout the entire raising phase (see Table 6). The major point is that lifters should develop a horizontal bar path that’s as close to the shoulders as feasible, and work probably toward the light expert path (as a guide). The novice lifter could benefit by modifying his bar path so that it is more similar to the one typical of the light expert group. Clearly this change would reduce the torque required at the shoulder. Are there any hidden costs associated with gaining this benefit? Yes, there is at least one. In moving the bar horizontally toward the shoulder, the perpendicular distance between the elbow and the line action of the bar is increased. The required extensive moment at the elbow is increased as the bar path is displaced toward the shoulder. The force required from the tricep must be correspondingly increased. For a novice lifter to benefit from a change in bar path he must have sufficient tricep force capacity. The data suggests that the novice lifter could benefit by shifting his bar path toward his shoulder. It appears that the novice is requiring too much moment at the shoulder and not enough at the elbow. A bar path displaced horizontally from the present path that approximately balances the shoulder and elbow moment requirements should exist. This path chance should improve performance without any increase required in muscle capacity. With experience with the new technique, tricep force capacity should increase and allow the novice to choose a bar path that more closely emulates that used by the competitive lifter. Other interesting questions that remain to be explored here. For example, the significance of the path in determining capacity, and particularly the differences in path during the raising and lowering phases poses some interesting questions about the design and use of exercise machines. Does the use of different paths in lowering and raising the bar “save” muscle force for the raising phase? These interesting questions await further study.